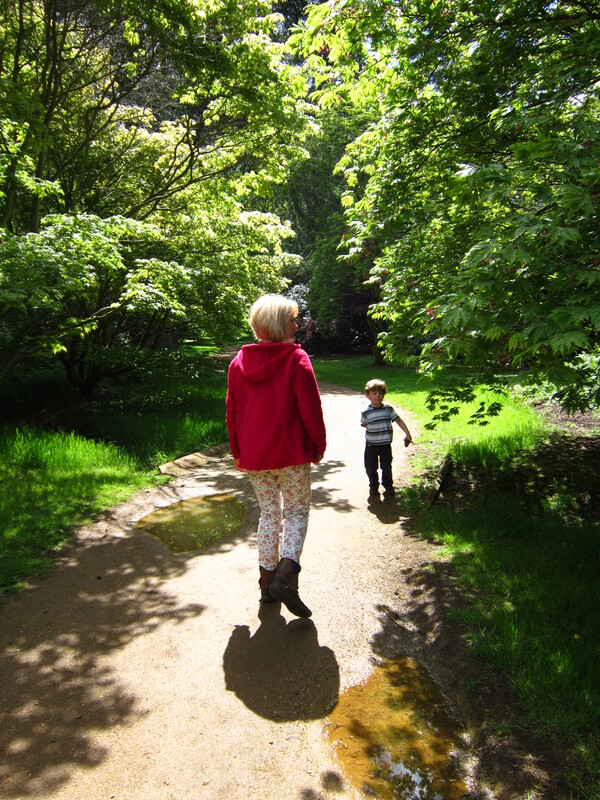 Most of us like to get our kids outside, if only to run off all that energy. But it’s not just open spaces that children need. 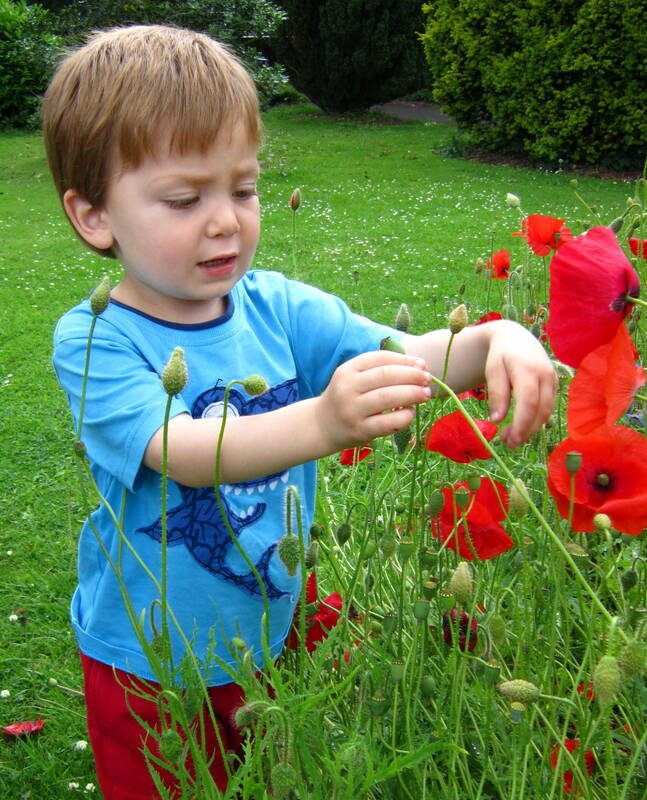 Most little ones have a deep affinity with nature, and from a very early age love nothing more than interacting wholeheartedly with our beautiful planet Earth in all its richness. For all the exciting and complex toys that can be bought in the shops today cannot really compete with the simple joys of paddling barefoot in mud, or foraging for wild violets. We impart the veneer of our cultural heritage to our children. But do we stop to think (like the native tribes) about whether their deeper, genetic, primeval heritage is important too? And is that really still relevant today? We want to give our kids every opportunity. We teach them to operate iPhones and Playstations, we buy the latest electronic toys to stimulate brain development. But…how much plastic does a child truly need? 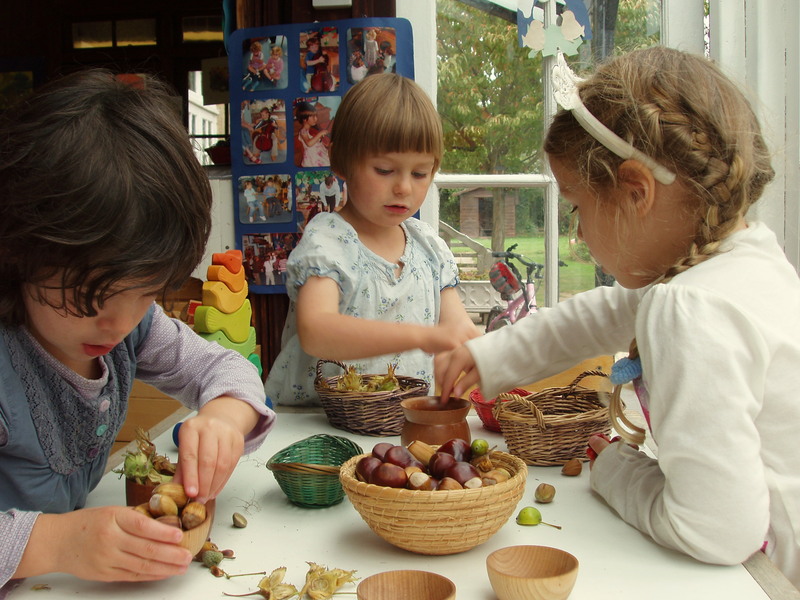 Children’s developing imaginations really blossom with very simple and natural resources, such as mud, leaves, twigs, seeds and nuts. The simpler the props, the more the child’s imagination has to project itself and reach out to make connections with the materials. 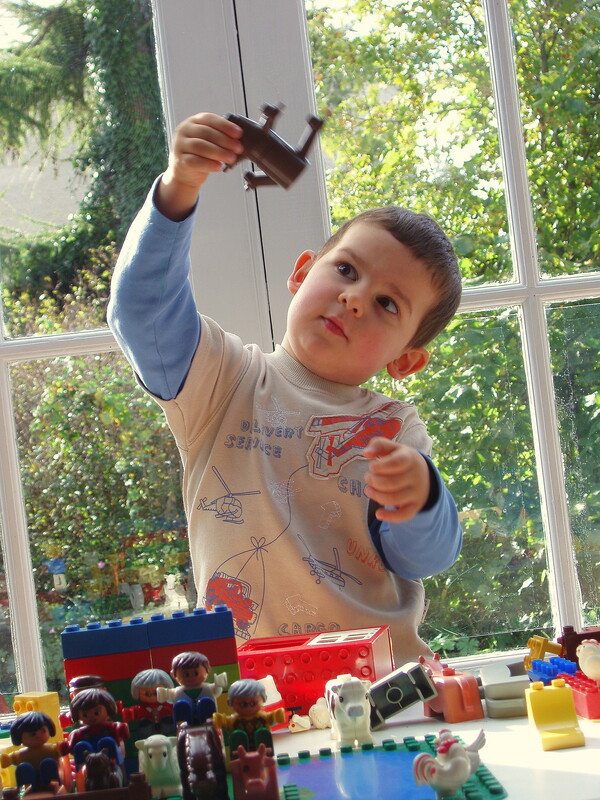 Often, detailed replica toys (i.e. 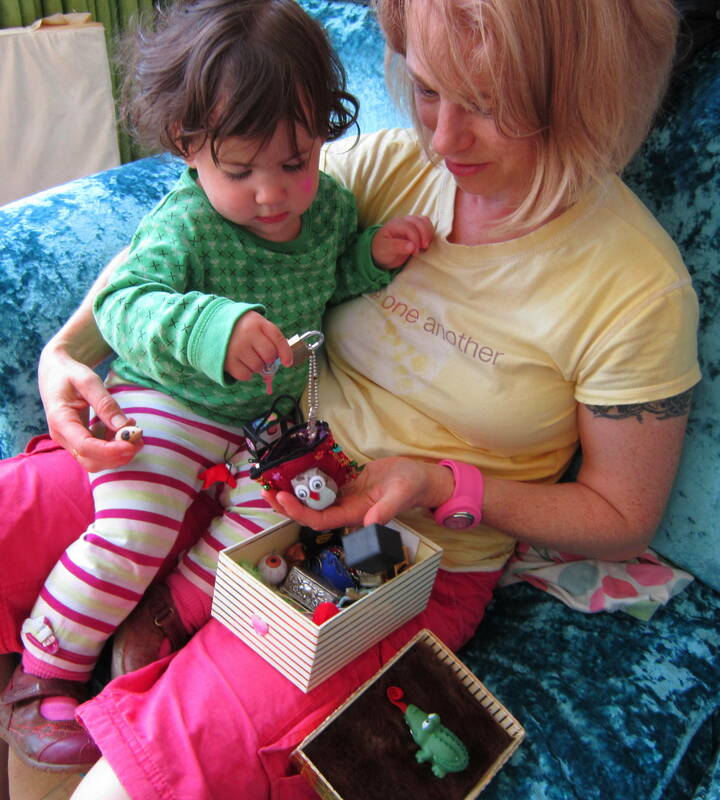 Barbie dolls, Playmobil, model farm animals etc) can limit your child’s imagination, because it is harder to imagine them to be or do anything else (though I have seen children try – I used to turn my dolls’ pram upside down and turn it into a tent). 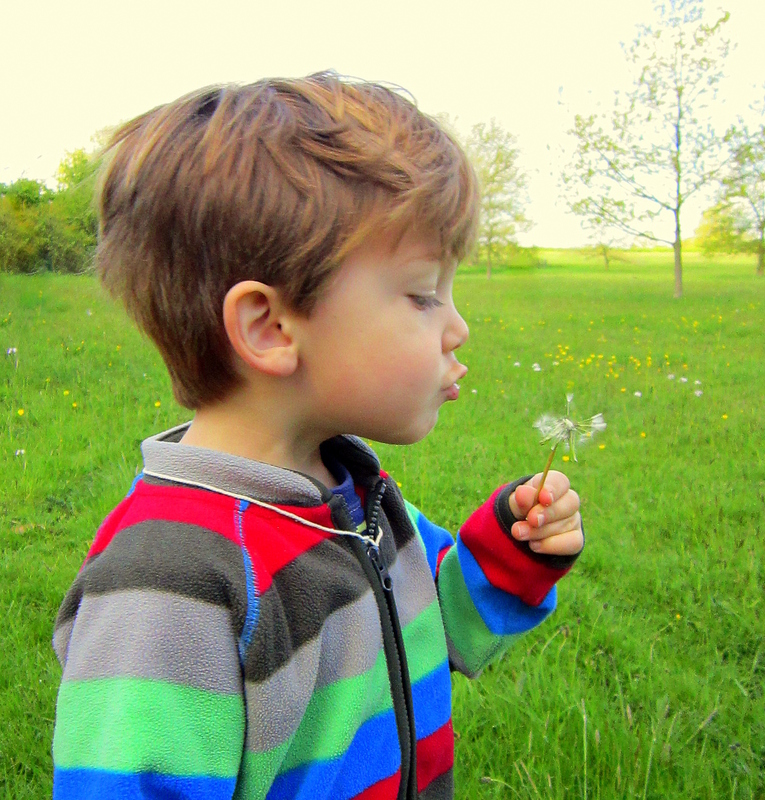 A leaf, a stick or a cone, however, could be anything a child wishes it to be…a lantern, a baby in a blanket, a plane, a spade, a bottle, a wizard’s staff, a tree……or in the case of the little boy below, a tiny boingy flower-trampoline for fairies…. 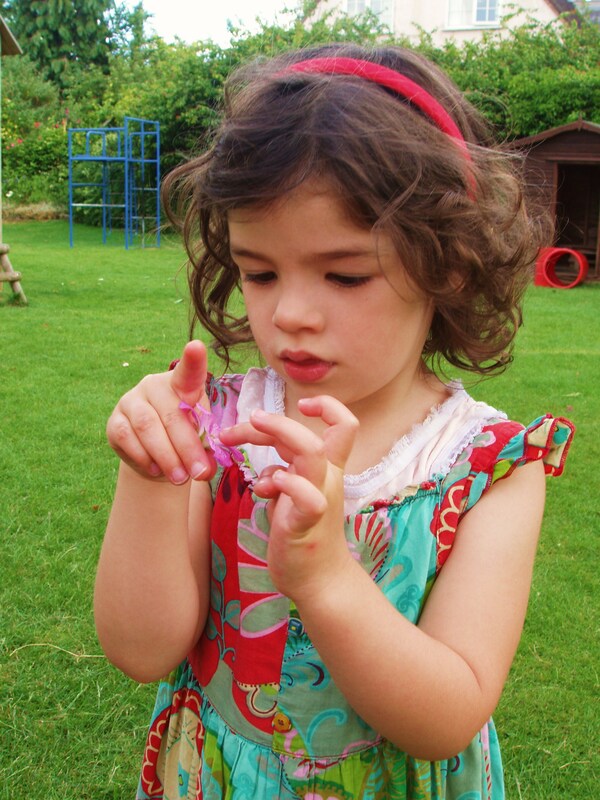 A small child’s imagination is infinite, because they haven’t discovered the limits of ‘reality’ as we know it. So they might well envisage a handy Duplo tree as a space rocket, or pretend a piece of creeper is a musical instrument, and their own self a singing bird in a leafy nest. I once found a very tiny boy curled up on the ground in the middle of the nursery forest garden like a bear cub, very peacefully gazing at the sky and absorbing the beauty and tranquility of Nature around him. I was reminded of a child at his mother’s breast. 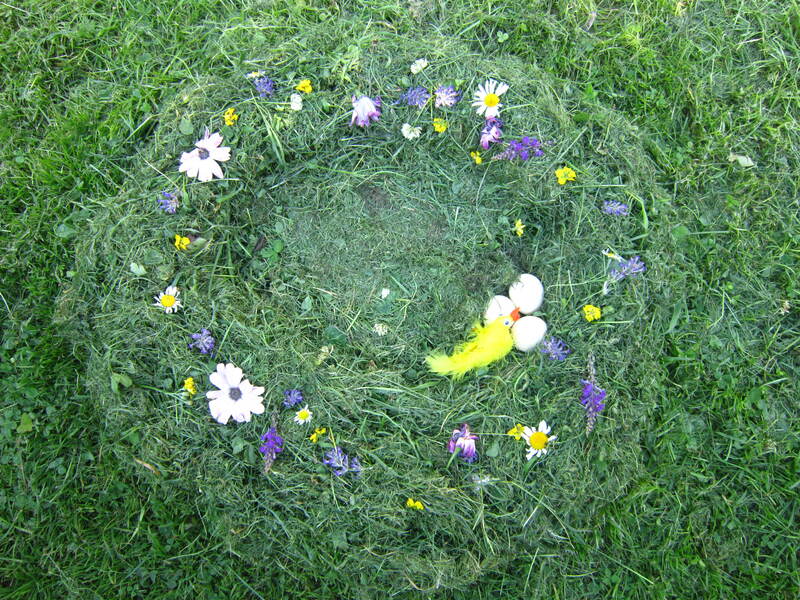 My friend’s 5-year-old daughter spontaneously decided to make this lovely bird’s nest out of grass cuttings and flowers after her Mum had mowed the lawn. It reminded me of my childhood, when me and my little sister used to make grass ‘forts’ and sit in our walled rings of grass pelting each other with ‘grassballs’! 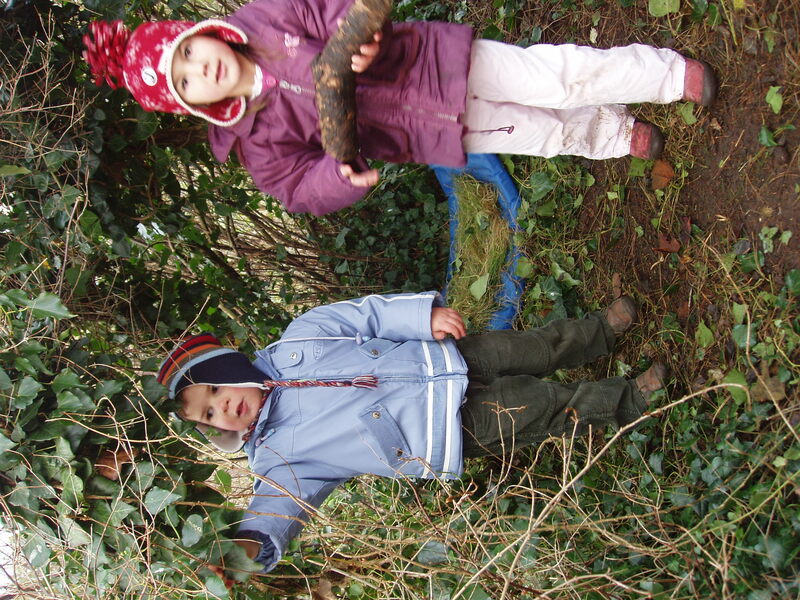 Grass cuttings are really versatile as an open-ended play resource. 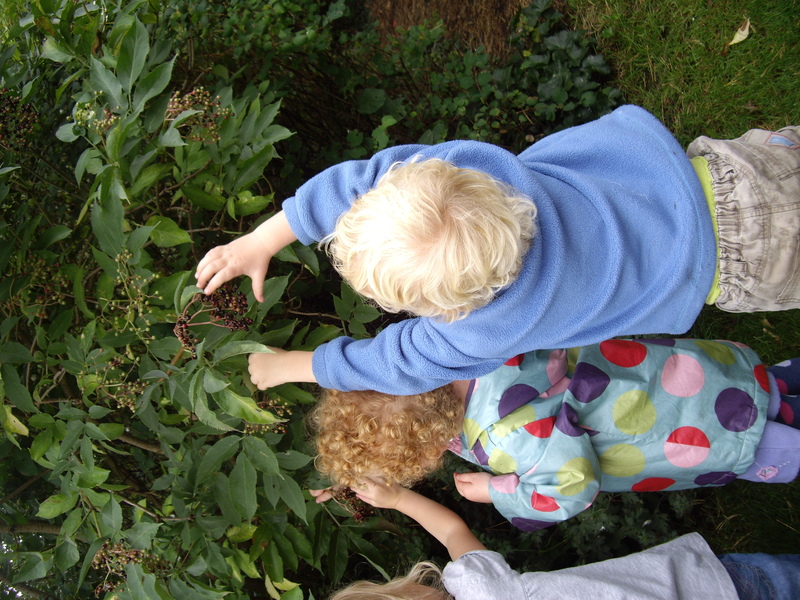 This nest could also be made into a mixing bowl to make a pretend ‘recipe’ using added leaves, cones, berries or pebbles. Earlier this week we went to the park, and the Council man had just cut the grass there too. 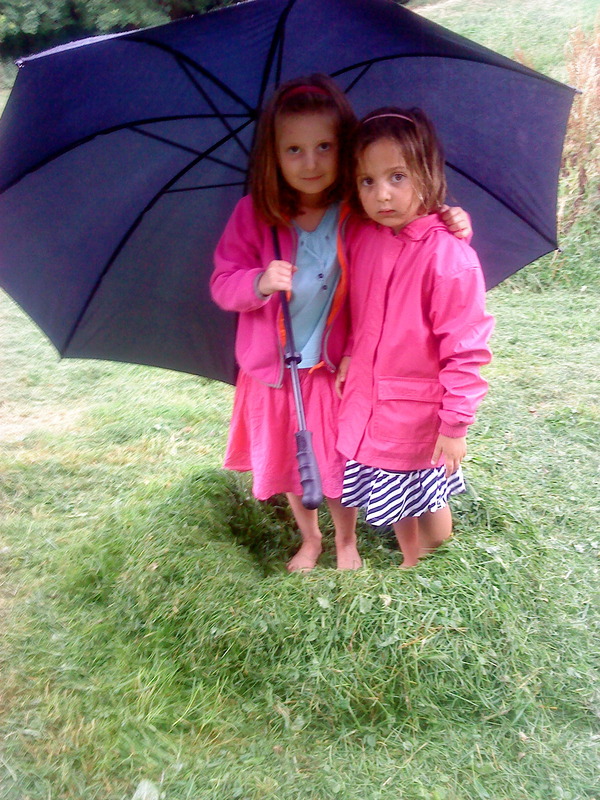 I encouraged the kids to make a grass crocodile, and we also made a little grass ‘den’, which came in handy (along with my big umbrella) when it began to rain! 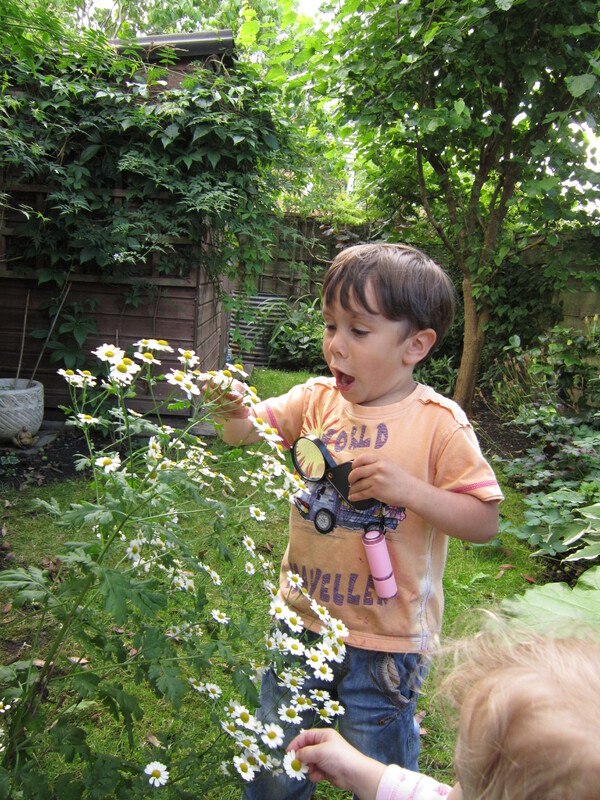 The beauty of flowers (or pulling them apart to find out how they’re made) often fascinates children. 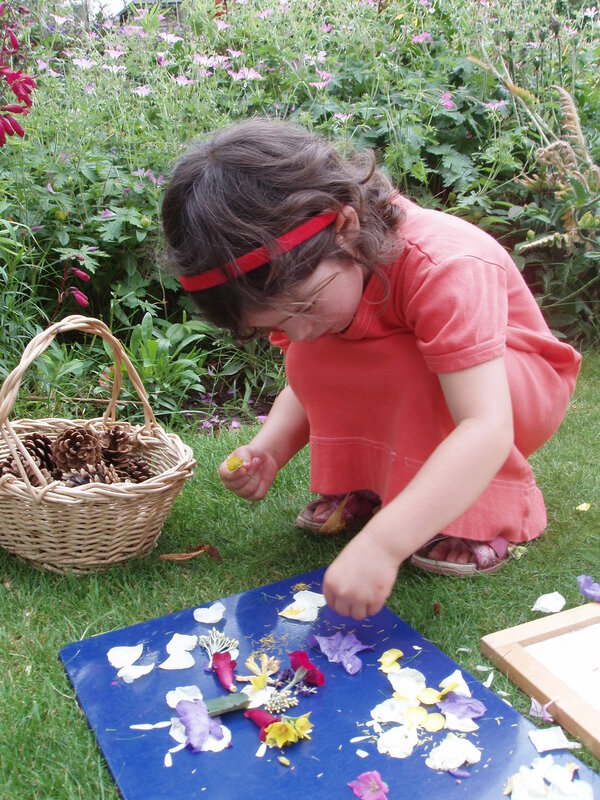 Leaf and flower play is a wonderful way to create transient art. For small children, art is mostly about the process of exploring the materials, rather than producing a pretty end result they can keep. The natural environment is fascinating and full of little treasures. 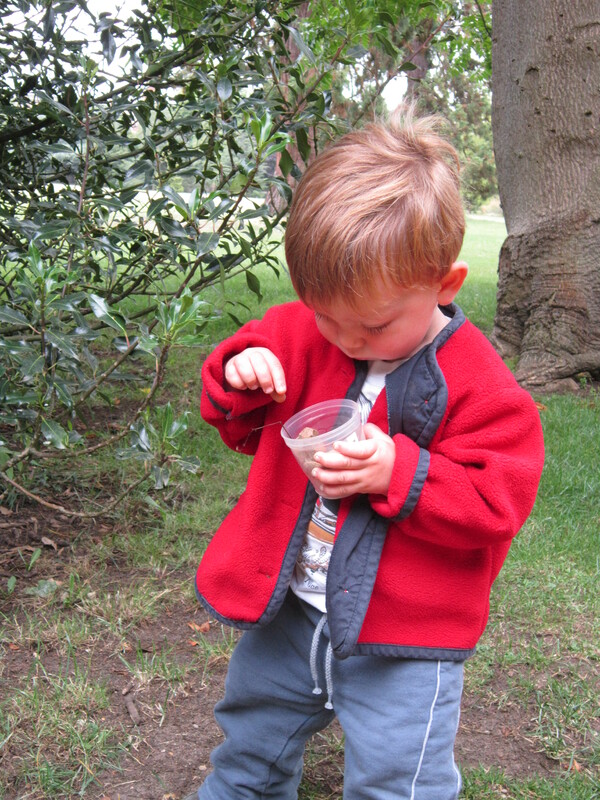 And most small children are captivated by creepy crawlies too! 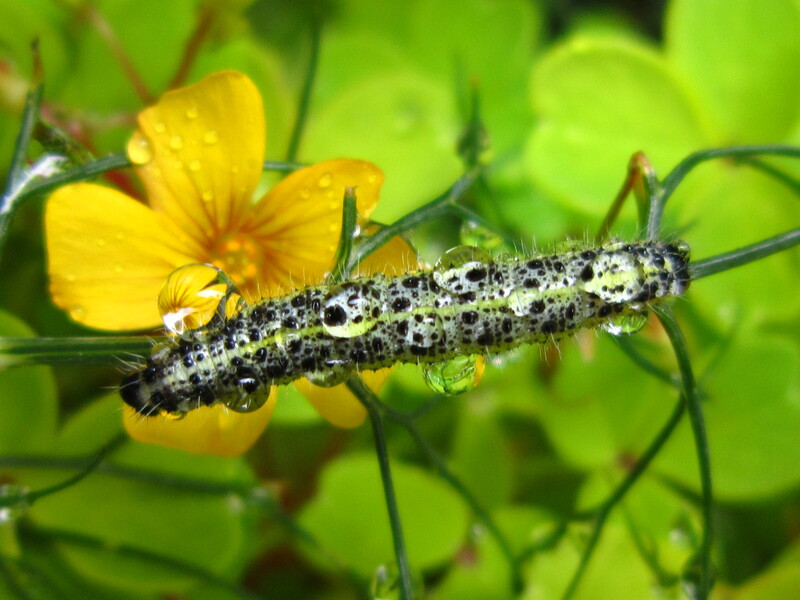 Discovering how a caterpillar can carry water drops on his hairs could be an occasion for wonder! 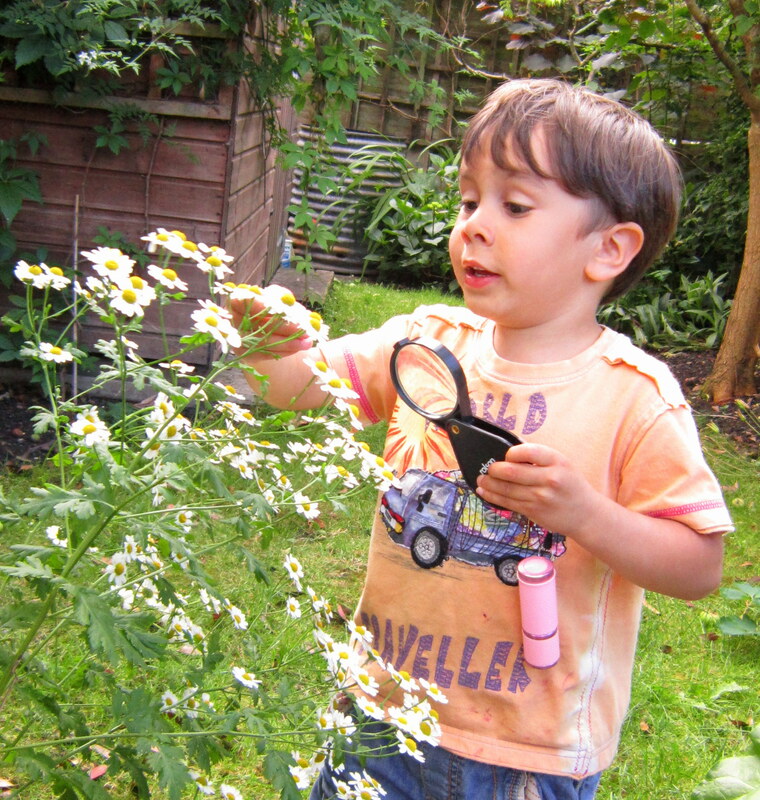 …and of course, it forms the basis for learning names for different flowers, stamens, petals, nectar etc and discussions of seeds, germination, pollination, growing, and the whole life cycle of living things! 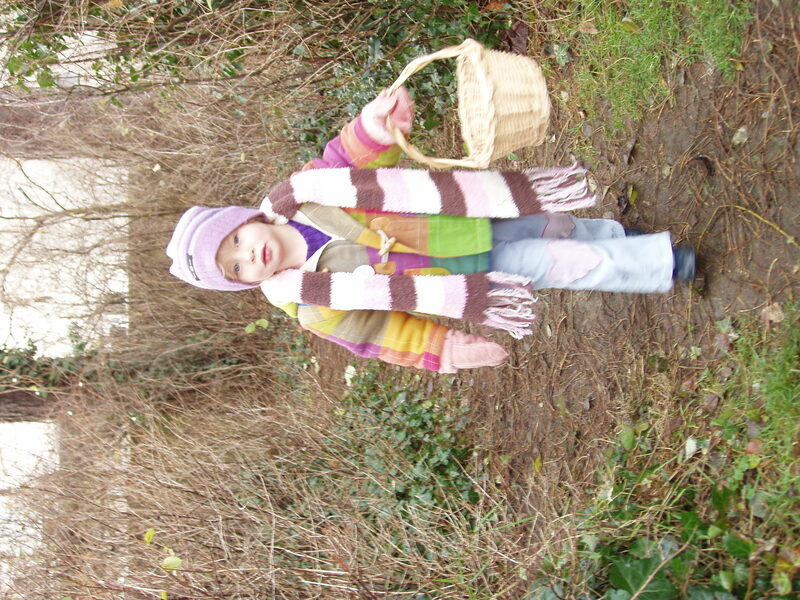 Children also love to collect cones, berries, seedpods, stones and leaves. I remember doing it myself as a small child. 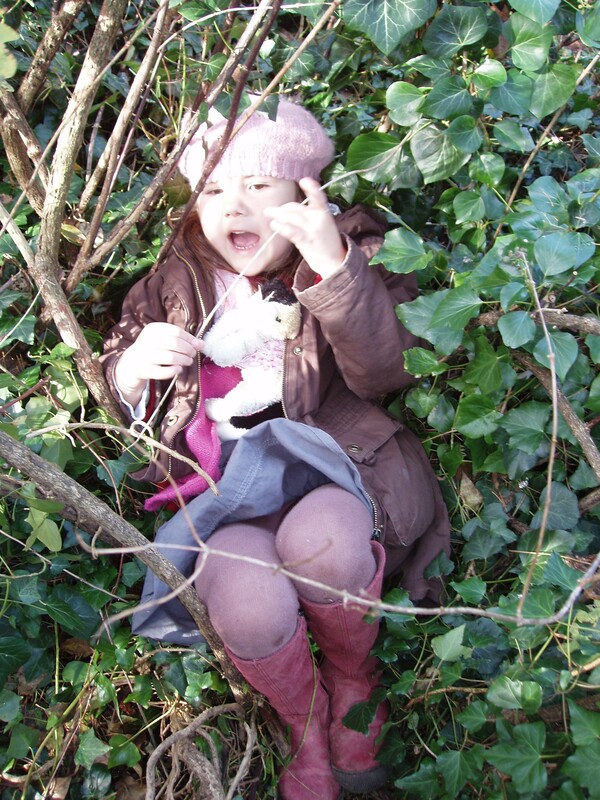 I think it must be a primitive hunter-gatherer instinct, because again and again I have seen groups of very young children head into the ‘forest’ (any clump of undergrowth), spontaneously form into little families, make a den and begin this collecting and gathering activity. 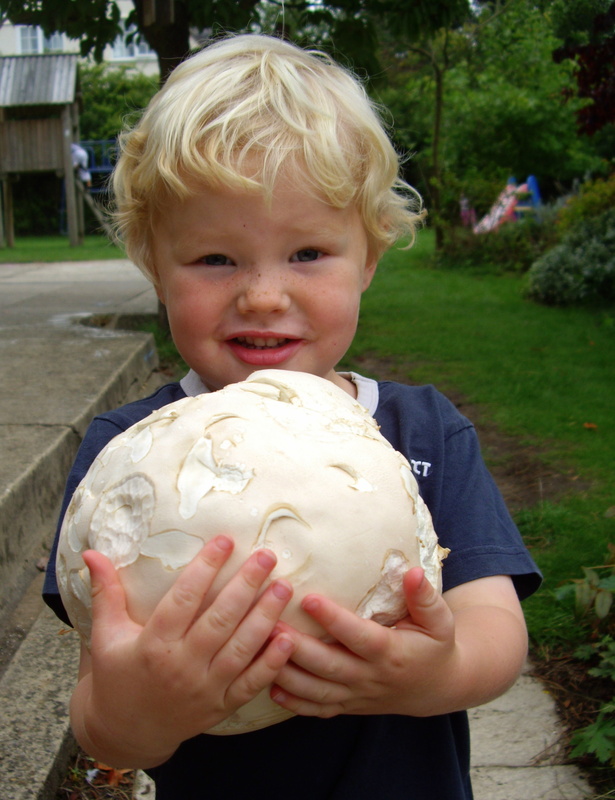 This boy found something rather special growing under a tree! What fun we had with Show and Tell that day. 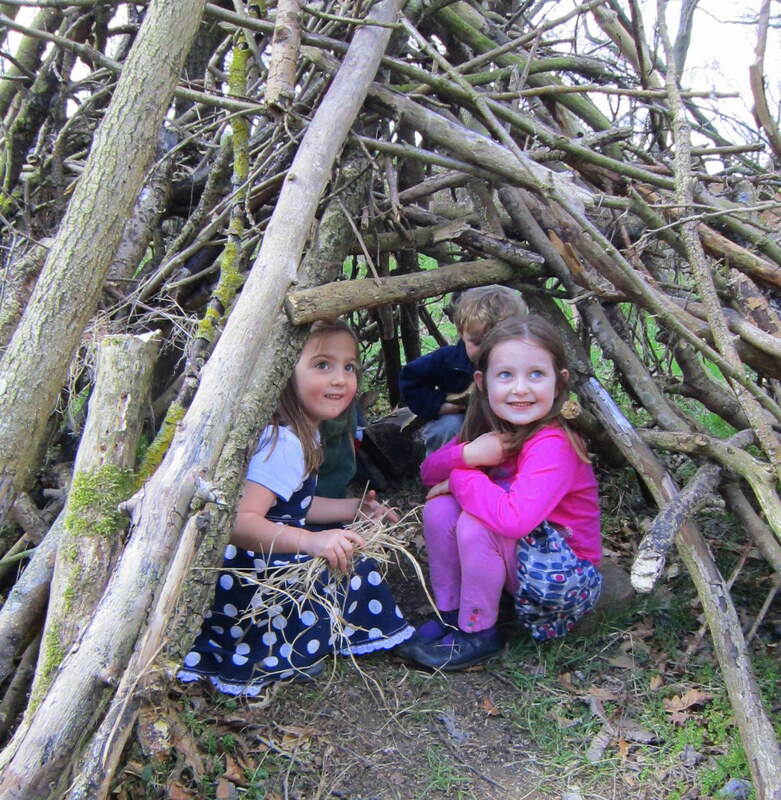 Making a den in the woods is a very exciting activity which again taps into that primeval instinct – close to the surface in young children – to create territory and a safe space. 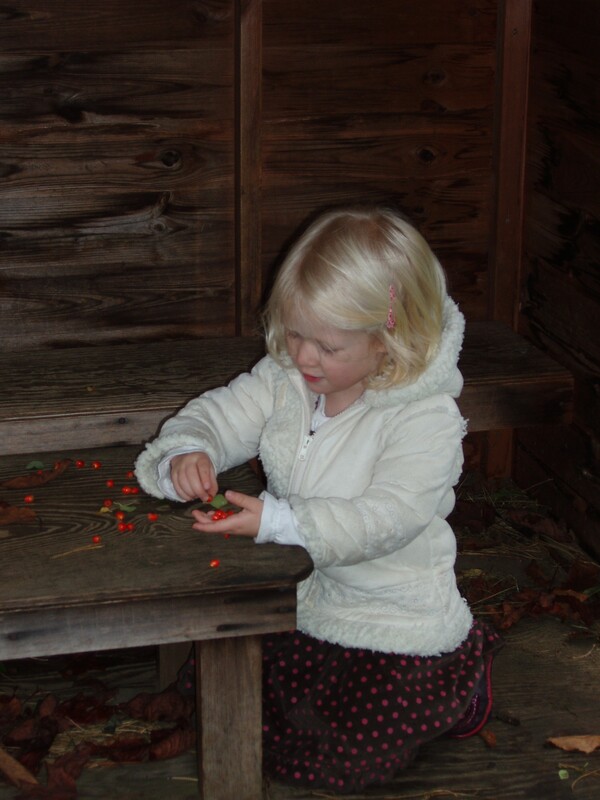 Collecting nuts is a lovely Autumn activity that many children spontaneously like to do from about the age of two. 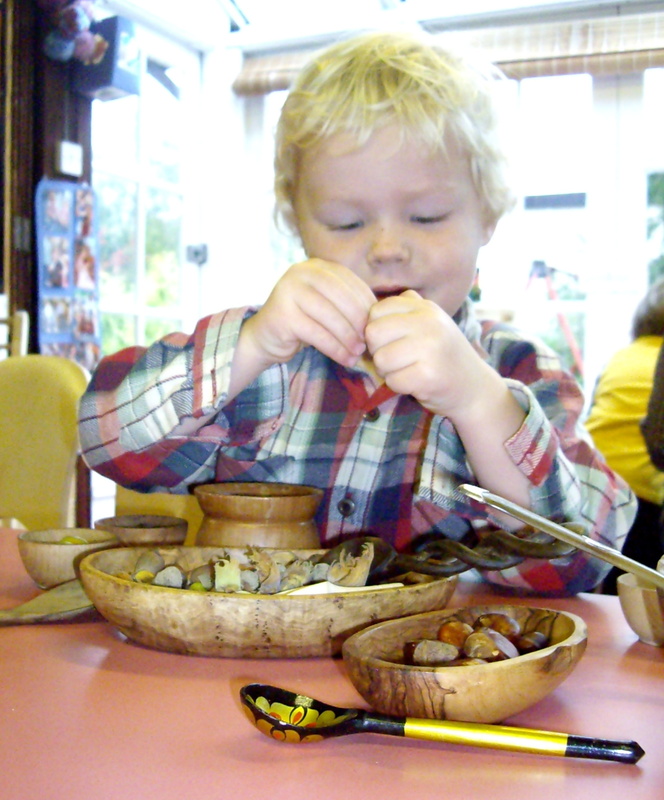 We have a large wooden box of nuts that makes a great resource for all sorts of sorting, counting and mixing activities. 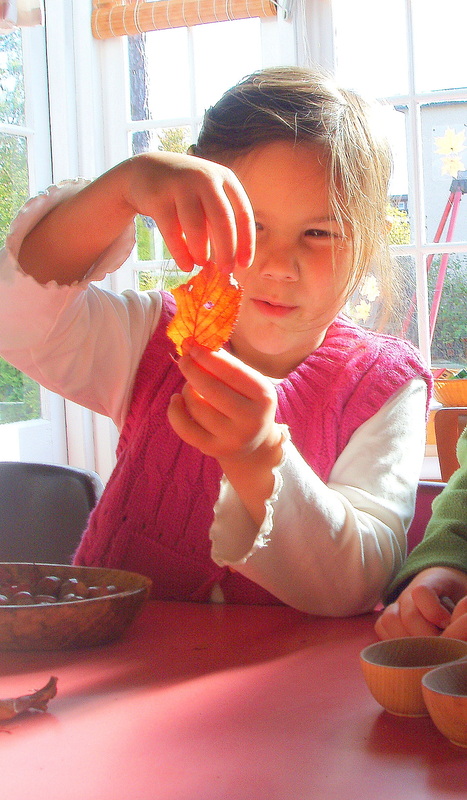 Children love to make ‘recipes’, sometimes adding all sorts of other items to the mix! Learning what nuts are for and their names is also very educational. We used the box of nuts to teach about animal hibernation and diet, and how trees grow. 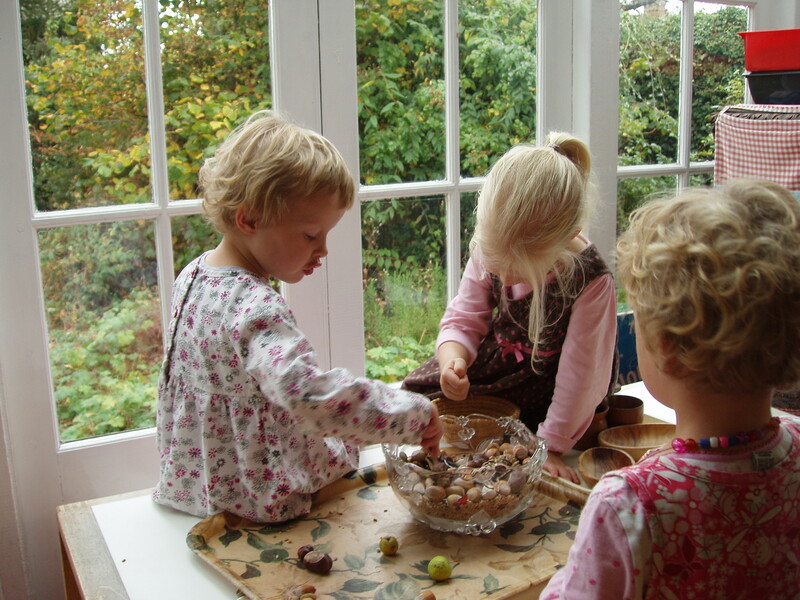 These children spent a happy hour or so each time, sorting, pouring and mixing their bowls of nuts and seeds. 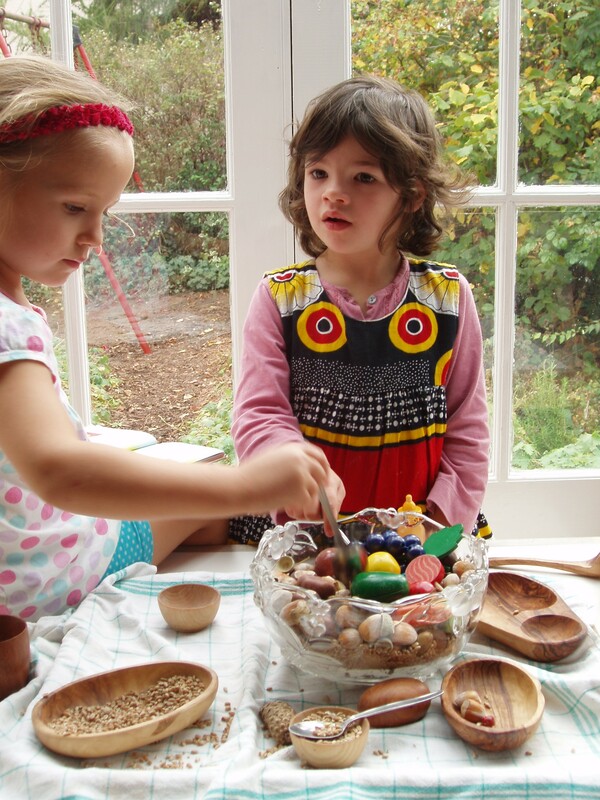 Making a nature display table for children to take apart and play with is another way of sharing the wonders of creation with your children. You can change it according to the season. 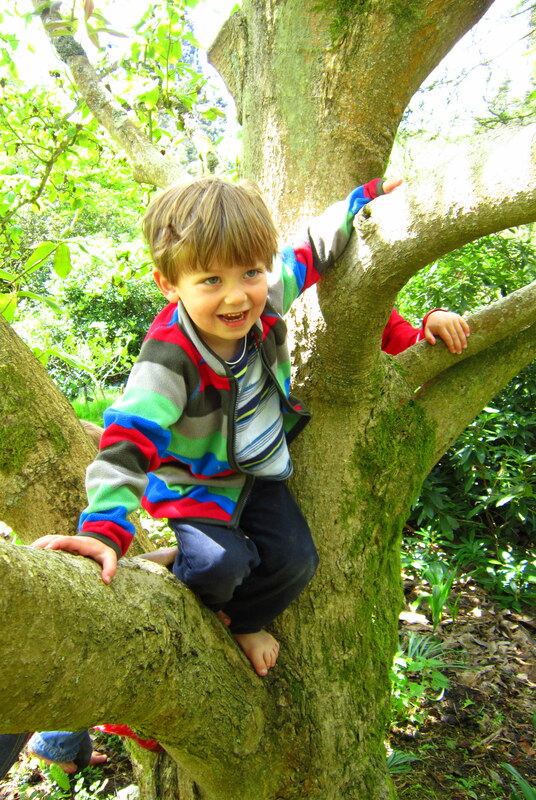 Tree climbing is a wonderful activity that strengthens this deep connection to the natural world, as well as building strength and agility – thus lessening the risk of accidents. 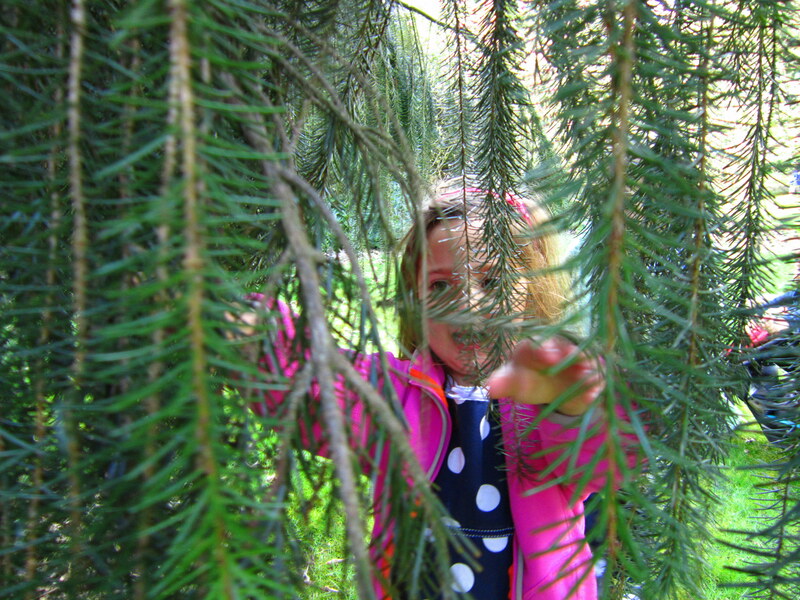 Mastering a challenge of her own choice also teaches a child to trust herself and increases her self-belief. 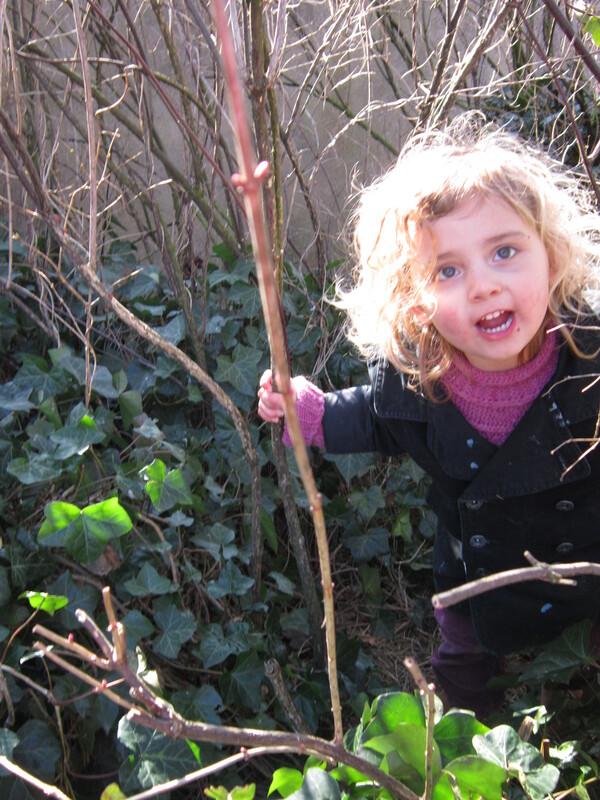 I can’t speak highly enough of the virtues of natural play. 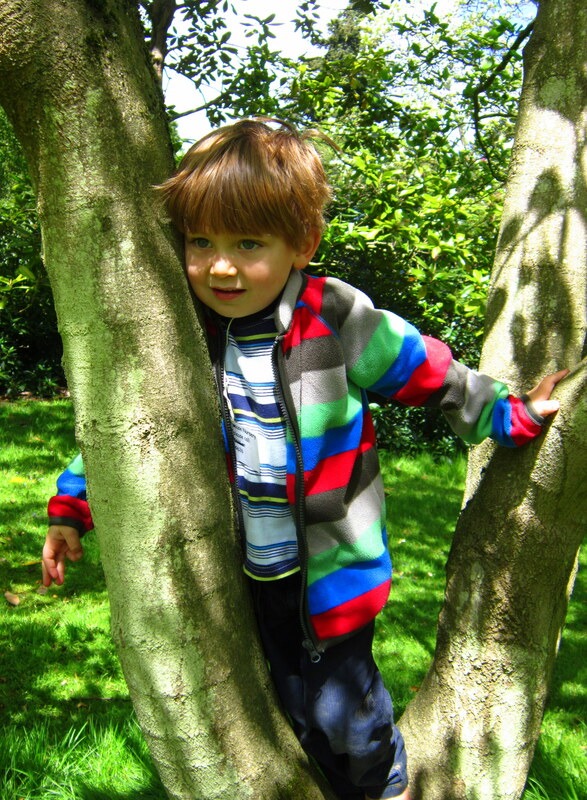 Please never underestimate the ‘fun factor’ of a muddy hole or puddle, a stick, or some leaves, twigs and nuts to your child! And don’t dismiss the inestimable value to their self-belief and strengthening character of a bit of wildness in the forest. Let them go with their instincts every once in a while, and try not to sanitize them out of their natural inclinations while they’re young. 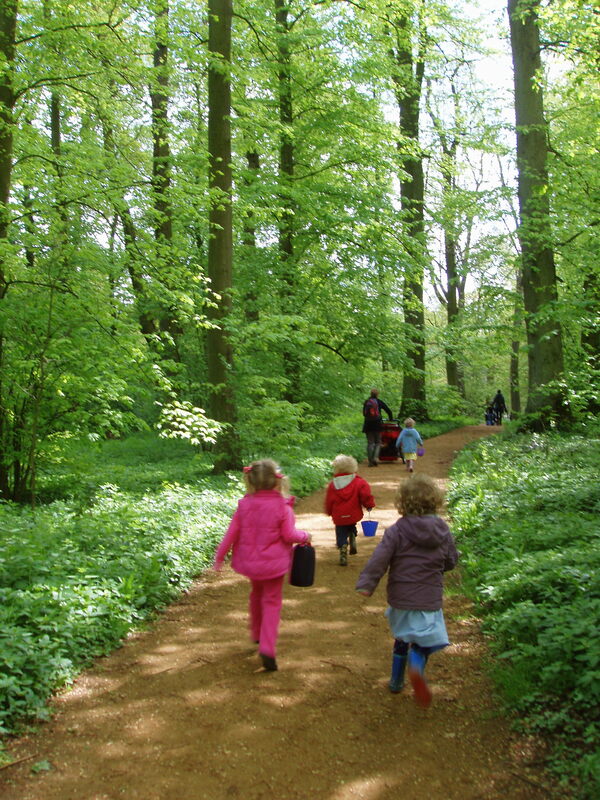 Once they have been indoctrinated with plastic, TV, ipads and Disney values for 7 or 8 years, it could well be too late to teach them to enjoy mud, trees and picnics in the woods. I don’t like those children’s stories that demonize ‘scary forests’ and the ‘big bad wolf’. 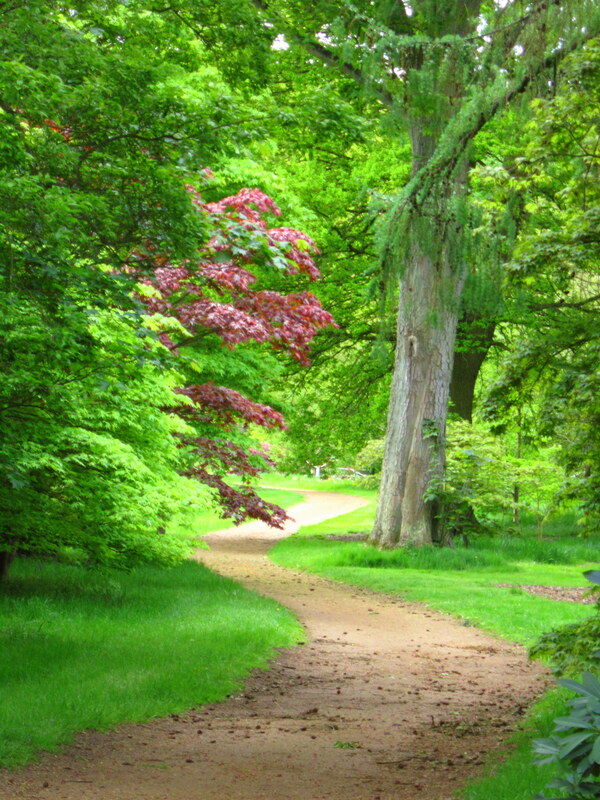 Forests are beautiful and essential to life on Earth. We need nature around us. 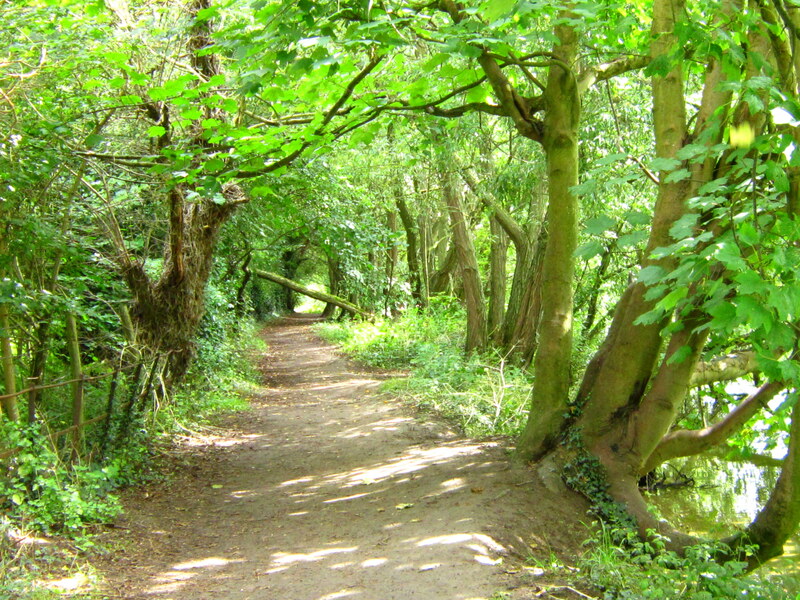 There is an actual illness called ‘Nature Deficit Disorder’. Whether you believe in God, Gaia or Darwin, we are human animals after all, and are created to live in the natural world.